Trapped Under Ice compilation – Out Now! Today January 25 is the official release date of the Trapped Under Ice compilation, released on CD, vinyl LP, and cassette tape formats. A Canadian tour featuring the majority of the compilation’s bands shall commence in April (dates below). Hear Trapped Under Ice Vol. 1 compilation in its entirety HERE. Canada is an often-misunderstood place. Beyond friendly smiles and quiet winter nights surges an undercurrent of darkness, power, and magic fed by the solitude and expanse of the country. The perfect breeding ground for…PURE HEAVY METAL MADNESS! 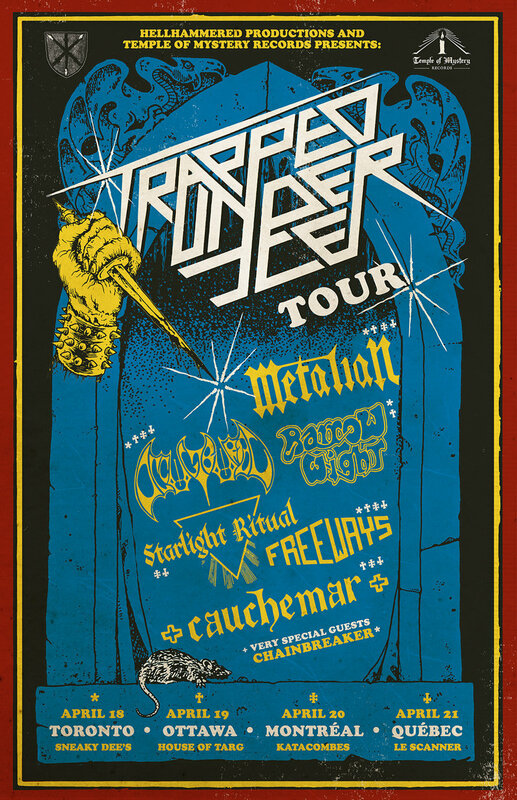 Temple of Mystery Records now presents ten incredible young bands from across the label’s wide and frosty northlands: Metalian, Spell, Traveler, Cauchemar, Freeways, Barrow Wight, Occult Burial, Blackrat, Emblem, and Starlight Ritual. With styles ranging from traditional metal to black/speed metal, each one provides an exciting track completely exclusive to this collection. Dive headfirst into icy waters and get Trapped Under Ice to discover the best and coldest new heavy metal bands from all over Canada!